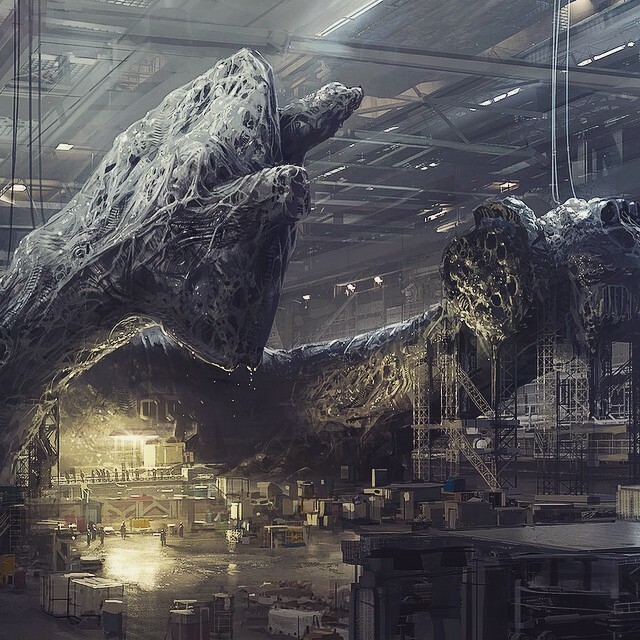 Earlier this year, the South African sci-fi director Neill Blomkamp posted concept art to his Instagram, stating that he may be working on a new Alien film, although the description that went with it seemed to suggest it may not be happening. But now it is happening! Blomkamp later stated that he was indeed going to helm the next Alien movie. Hooray! However, the whereabouts in this franchise’s timeline it will be placed took some clarifying, and it’s neither after the latest Alien film in the timeline (Alien: Resurrection), nor does it take place after the last Alien film to come out (the modern-day-set Aliens vs Predator: Requiem), nor does it have anything to do with the Alien prequel Prometheus. Blomkamp has actually taken the series into his own hands, placing his new film after Aliens, creating his own timeline strand that will retcon the series and nullify and ignore Alien 3 and Alien: Resurrection. The reason being is the first two Alien films are highly regarded classics, with every other film in the series ranges from mixed criticism to outright panning, and Blomkamp feels his film will be worthy of following directly on from those two. Blomkamp alludes to himself being “one of the most egoless director in the world“, something only an egotistical filmmaker might say, and what he is doing seems highly egotistical. To disregard all but the classics of this sci-fi franchise and then insert his own sounds like he believes his Alien film will be worthy of being associated with the two classic first films, even before he’s even shot a single frame of it. Blomkamp said “now I get to make the third film of the first two, which I think never happened. I think they made the first two and then went off the rails with these other ones.” Another film that went off the rails was Elysium, Blomkamp’s second film after the acclaimed District 9, which was released to an incredibly lukewarm reaction, which its creator very recently stated his regrets, claiming “I just didn’t make a good enough film is ultimately what it is… the script just wasn’t there; the story wasn’t fully there… I almost want to go back and do it correctly” – I don’t see what’s stopping him, he’s already content with remaking other peoples’ films. Now Blomkamp is speaking of his Alien film like it’s immune to the disasters that befell Alien 3 and Elysium. When director David Fincher was making Alien 3, he wasn’t trying to make it bad on purpose, who’s to say that Blomkamp’s Alien 3: 2 will be the actual third in the series we’ve wanted? It might end up being trampled on like Elysium and then someone else can come into make Alien 3: 3 until we all decide on which one is right for the series. Despite the current trepidation surrounding this kerfuffle, it’s hard not to get excited over a new Alien film (that is, a proper new Alien film). This director does seem like an appropriate choice, with the concept art he has posted so far looking pretty neat, and he says that although Alien and Aliens are his favourite films, he as a fan has said “I don’t look at the situation like now I have to live up to these movies and all the fans are looking” which is a terrific thing for any artist to say (as he calls himself), as he will be trying his best to bring us a great film that goes back to the monstrous roots of the first two films, rather than pander to all the fans. Worth getting excited about? As always, let’s wait for the trailer.